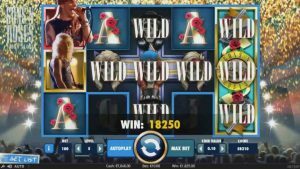 Guns N Roses Slot Review is here. This online video slot is inspired by the biggest selling rock band in history Guns N Roses. This is a 5 reel and 20 pay-line slot. Featuring Wilds, Expanding Wild Symbols, Free Spins, Multipliers, Random Features and several Bonus Rounds. 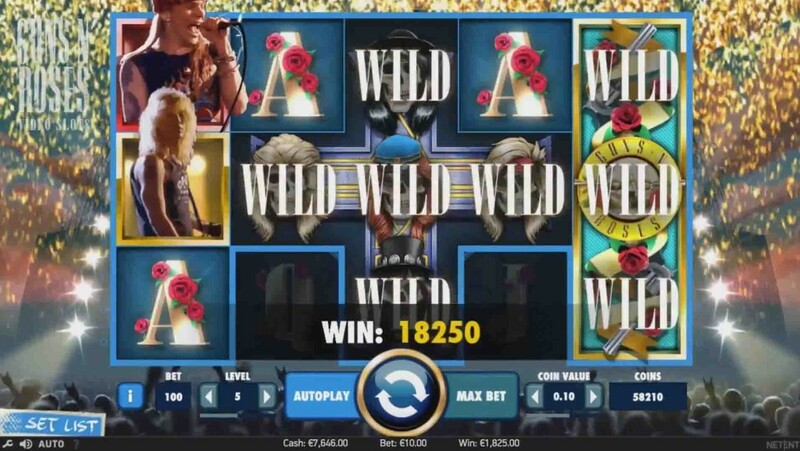 You’ll go ‘reel’ wild for Guns N Roses slot. As NetEnt welcomes players to the jungle with their latest slot release. For those of you who don’t know or may be too young to know, I’ll briefly tell you who Guns N Roses are. They are an American hard rock band from Los Angeles and they were around in the 1980’s and 1990’s. They are one of the biggest selling bands in music history. Releasing 6 albums selling over 100 million records worldwide. They are behind famous songs such as ‘Welcome to the Jungle’ and ‘November Rain’. Guns N Roses slot is a 5 reel, 3 row and 20 pay-line slot game. With features like Wilds, Expanding Wilds, Free Spins, Multipliers, Random Features and a Bonus Round. You can spin the reels of Rock N Roll from 10p all the way up to £250 a spin. You can ‘reel’ in some rock royalty here. The start of the game features the band members playing in front of stadium which really sets the mood of the game. As you spin the reels you’ll see in the background a stadium. The symbols represent the Guns N Roses and their vibe, with skulls, guns, roses and crosses. The graphics and animations are great. There has been incredible detail and attention has been given. 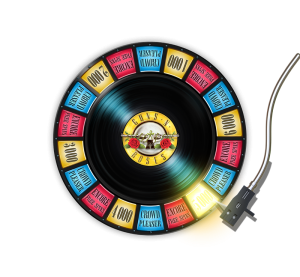 Guns N Roses Slot also features a set playlist with a choice of five different tracks to play during the game. You’ll be singing when you’re spinning! Guns N Roses has Random Features in the Main Game which are started by Random. They include Legend Spins, theAppetite for Destruction Wild and the Solo multiplier. If you’ve played NetEnt’s Koi Princess slot then you’ll be use to this feature as it acts in the same way. This is represented by the Guns N Roses symbol itself, this can appear anywhere on the reels at anytime except for reel 3, in the Appetite for Destruction Wild feature, and substitute for all symbols except for Bonus symbols. The Wild Symbols turn into an Expanding Wild which automatically expands to cover the entire reel. This will help boost your winning even more. The Expanding Wild symbols acts as a substitute for all symbols except for the Appetite for Destruction Wild. The overlay Wild in Legend Spins and the overlay Stacked Wild in Encore Free Spins. It looks like a lot to take in but once you start playing it’s easy to get. This Wild is based on one of Guns N Roses classic songs ‘Appetite for Destruction’. The Appetite for Destruction Wild feature is an overlay Wild symbol in the shape of a cross that can land randomly. Either fully or partially displayed on one of 3 possible reel positions. The Legend Spins feature will randomly award 3 re-spins with 1-2 Stacked Wild reels. Making this very lucrative feature. This is where you’ll see the band members the most. From the 1st spin on reel 3 is a Stacked Wild reel. Then on the 2nd spin reels 1 and 5 are Stacked Wild reels. On the final spin reels 2 and 4 are Stacked Wild reels. The Solo multiplier feature is a random multiplier that awards a win multiplier of x4 up to x10 to a winning line. When all the bet line wins consist of matching symbols or matching symbols including wild substitutions. The Solo multiplier will be activated if there are at least 3 matching symbols in a bet line win. There are also Bonus Features to get stuck into as well. This includes Encore Free Spins,Crowd-Pleaser Bonus Game and Coin Wins. To activate the bonus feature you need 3 Bonus symbols showing on reels 1,3 and 5 in the main game. Which will then randomly award one of 3 features. Once the bonus feature has been activated a wheel will appear and start spinning. You then have to press stop. This is a feature the wheel can stop on, the coin win is anywhere between 200 and 600 coins. If you activate this you will be given 10 free spins. During this, a band member symbol will appear as an overlay Stacked Wild symbol. On reels 2, 3 or 4 in each spin. This will act as a wild symbol boosting your winnings further. You can also get free spins can also be gained during this round. This is my favourite part of the game. The Crowd-Pleaser Bonus Game is a Pick & Click game with 3 levels to it. You will have a number of picks which award coin wins. The maximum is 600 coins at a time. There’s also a levels element to it which you can move up. Level 1: 3 clicks are awarded out of 8 picks to award coin wins. 60 coins is the minimum coin win awarded. Level 2: When the minimum of 60 coins is collected in Level 1. You will see the number of picks remaining is 0. At the start of Level 2 and three new picks are awarded. Level 3: Activates when 300 coins or more gathered from levels 1 and 2. Either there are no picks left or all the instruments have been selected.